Pour marinade over sliced beef. Cover, place in the refrigerator and let set for 30 minutes or up to one hour. Heat coconut oil in a pan. 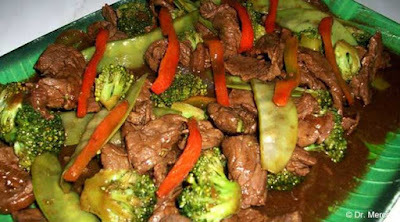 Place marinated beef in the pan and cook until it becomes tender. Set aside. In another pan, sauté garlic and then add broccoli, lima bean pods and red bell pepper. Cover and let simmer for one minute. Add water or beef broth. Cover and bring it to a simmer for one minute. Add the beef to the vegetable mixture, and all juices accumulated. Cook for three minutes longer, stirring frequently.